Rodelyn D Cabrera, 37, Purok 2, Lower Sagadan, Baroy, Lanao del Norte taking a break from construction work at the site of the 120 Linear Meter Seawall community sub-project. Rodelyn D Cabrera, 37, Purok 2, Lower Sagadan, Baroy, Lanao del Norte, is married to Enrico Cabrera and is a mother of two. Enrico is a fisherman, however, this is not enough to sustain their family’s basic needs. Rodelyn accepts “labada” (laundry services) from their neighbors. There are times when she even accepts all-around household cleanups. Rodelyn exerts more effort in ways to produce income – other than their children, they are raising three other children, abandoned by her sister who is a widow. Rodelyn’s family is a Pantawid Pamilyang Pilipino Program (4Ps) beneficiary, and falls under the level one (or survival stage) based on the social welfare assessment. This means that the family belongs to the poorest of the poor. Jenny Cabatingan, a 4Ps Municipal Link endorsed the family for prioritization in the work once the construction of the DSWD Kalahi-CIDSS Community Sub-Project began. In September of 2016, the community sub-project of Lower Sagadan started, Enrico was among the workforce. Enrico, however, only lasted for a day, fallen ill and unable to continue. 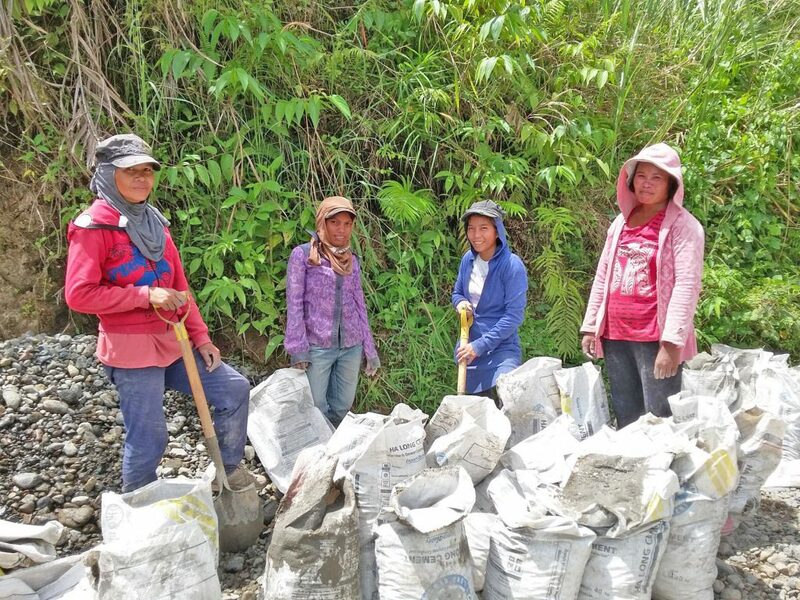 The Barangay Sub-Project Management Committee (BSPMC) of Lower Sagadan, on the other hand, acknowledged that the family needs the opportunity to work in the construction considering the number of children they raise. The community sub-project follows a “shifting” method of cycling through the workforce who are also members of the community, each laborer is allotted a 1-week schedule due to the bulk of interested takers. However, a foreman can recommend for a laborer to continue for other schedules to expedite construction progress, in turn, the laborer will be able to continue working on the following shift. The foreman took notice of Rodelyn’s hard work and enthusiasm as she is always on the foreman’s list of laborers, “kung naa ang akoa pangalan sa lista maam, motrabaho ko (if my name is on the list, I would really work)” Rodelyn says. Though the pay she received from working on the sub-project was not enough to sustain daily needs and her husband’s medication, Rodelyn says she is still thankful for the opportunity, and hopes that there could be more community-based projects where the community can earn while implementing the projects. “Bahalag init o maulanan ko pagkahapon basta tagaan lang ko sa Ginoo ug maayo nga panglawas, motrabaho jud ko para sa akoang pamilya (I don’t mind the heat or rain, as long God gives me good health, I will work for my family)” Rodelyn concludes. 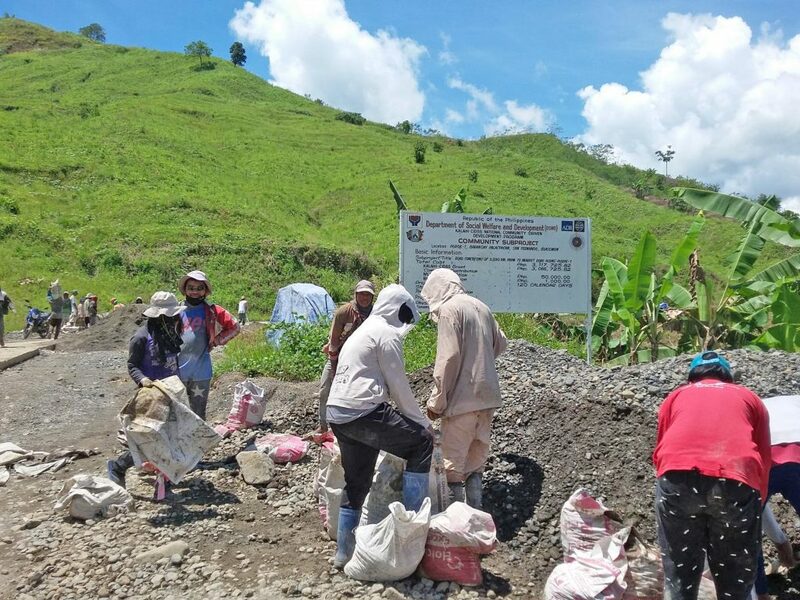 The DSWD Kalahi-CIDSS community subproject in Lower Saganan, Baroy, Lanao del Norte is the construction of a 120 Linear Meter Seawall which stretches from Purok 2 through Purok 5 of the barangay and costs P2,825,874.00. The DSWD Kalahi-CIDSS grant of P2,509,291.94 and a local cash counterpart from the Province of Lanao del Norte of P46,946.00. The Municipality of Baroy also provided a total of P169,853.00, both in cash and in-kind local counterparts. The Barangay Local Government of Lower Sagadan also contributed 10% of their barangay development fund amounting to P32,083.06. The community of Lower Sagadan also provided a total of P67,700.00 in-kind contributions. The community also accomplished the sub-project within the 90 calendar days stipulated in the sub-project implementation from September to December 2016. Community-Driven Development (CDD) is an approach that gives the community control of the development process, resources and decision making authority and regarded as the best assessors of the needs that their communities. The communities also have the responsibility of implementing, managing, and operating the sub-projects they have planned as well as maintenance. In the Philippines, CDD is implemented through the Kapit-Bisig Laban sa Kahirapan Comprehensive and Integrated Delivery of Social Services – National Community-Driven Development Program (Kalahi-CIDSS NCDDP) under the Department of Social Welfare and Development (DSWD). TATAY ESLAO. Estanislao “Eslao” Singgo, 78, of Purok 1, Lower Sagadan, Baroy, Lanao del Norte was once a farmer in Gingoog City. However, alcohol dependency forced him to return home to Baroy. Having no family of his own, Tatay Eslao lives with his two sisters who are 50 and 54 years old respectively. They were all raised in poverty which he puts it as “isang kahig, isang tuka” (a Filipino term used to describe extreme poverty liking one’s daily life to that of how a chicken gathers food), and were unable to finish their education. Community Sub-Project in Barangay Lower Sagadan. Tatay Eslao and his sisters rely heavily on “utang” (loan) from neighbors to sustain their basic daily needs, without any assurance of actually obtaining a loan on a daily basis – or how to pay back the debt. Prior to the commencement of the implementation of the DSWD Kalahi-CIDSS Community Sub Project of Lower Sagadan, which is the construction of a 120 Linear Meter Seawall, all purok leaders together with the established Barangay Sub-Project Management Committee (BSPMC) convened and informed all skilled and non-skilled residents of the labor opportunity during the construction. Rollybeth C. Santiago, purok leader of Purok 1 and a member of the BSPMC, immediately informed Tatay Eslao about the opportunity. This sparked Tatay Eslao’s interest and grabbed the chance. However, on his first day of work shift, Tatay Eslao unfortunately got injured. His left pinky finger was accidentally hit by a sharp, uneven stone during hauling. Because of this, he was relieved from work and was only able to receive a day’s work compensation. After weeks of being in medical treatment, Tatay Eslao was given a go signal by the BSPMC and the foreman to resume another scheduled work load. Despite his age, he is optimistic that he would be of help to the community – in ways that he can. He believes that as long as life gave him the strength and perseverance to continue living, he would work to earn, and be grateful. This gave opportunity for Tatay Eslao to repay his debts to some of the kind-hearted community residents who have also helped him. He is hopeful that other opportunities would come along to uplift his current situation and that of his sisters. community sub-project in Lower Sagadan, Baroy, Lanao del Norte. In true “bayanihan” (civic unity) spirit, the community also provided a total of P67,700.00 in-kind contributions. The community also accomplished the sub-project within the 90 calendar days stipulated in the sub-project implementation from September to December 2016. Barangay Palacpacan is an isolated barangay of the Municipality of San Fernando, Bukidnon. The road is difficult to access especially during the rainy season. Most of the residents of the barangay are people of the Matigsalug Tribe. Like the other tribes in Bukidnon, most of the lumads are given less priority from the government projects that would uplift them for a better life. This is because they have minimal support and most have no access to basic social services within their communities. With this, the only priority they have is to eat and survive. Time passes and now some of the government agencies are now reaching and responding to address the needs in the community. The Department of Social Welfare and Development (DSWD) is one of the agencies that help address the development of lumad people, providing them basic social services. Among the myriad of programs is the DSWD Kalahi-CIDSS. Jeraline Arion, DSWD Kalahi-CIDSS BSPMC Chairperson of Barangay Palacpacan, San Fernando, Bukidnon, performs during the Regional Community Volunteers’ Congress in Cagayan de Oro City, March 27, 2018. Jeraline Arion is the Barangay Sub-Project Management Committee Chairperson (BSPMC) of Barangay Palacpacan, who strives to help the community by participating in government programs provide basic social services and empower the communities. Jeraline is a Matigsalug and an active Parent Leader of the Pantawid Pamilya Pilipino Program (4Ps) and Sustainable Livelihood Program Association (SLPA) leader. For her, DSWD Kalahi-CIDSS is the first government program that gave opportunities to the Lumad people in handling the processes of the activities and giving them the power of decision making. Women laborers of Barangay Palacpacan, San Fernando, Bukidnon sack aggregates for delivery to the sub-project site. Through the Kalahi-CIDSS, Jeraline felt that she and her Lumad community now have the voice through the program. The Kapit-Bisig Laban sa Kahirapan Comprehensive and Integrated Delivery of Social Services – National Community-Driven Development Program (Kalahi-CIDSS NCDDP) is a program under the DSWD that empowers communities. The program uses Community-Driven Development (CDD) as an approach to let the communities identify problems, use available resources, and decide solutions to help the community in order to have access of good basic social services. The communities are given the opportunities to voice out their needs in the barangay by participating in the local development processes with the help of the non-government organizations, Local Government Units, Area Coordinating Teams (ACT), Sub-Regional Project Management Team (SRMPT), and Regional Project Management Team (RPMT) to ensure that they become actively involved in the local processes. “Dili sayon gayud nga mahimong leader sa Kalahi kay kaming mga Lumad wala na-anad magpadayag sa kadaghanan, kay kabalo kami nga wala kami grado nga ikapaghinambog pero tungod sa mga meetings ug trainings sa Kalahi ug pagdumala sa sub-project namo nga Farm-to-Market Road nadasig ako og taas na akong paglantaw sa akong kaugalingon karon kaysa sa una (It is not easy being a Kalahi leader, as we the Lumad people are not used to addressing a lot of people, because we know that we do not have educational degrees to boast for, but because of the meetings and trainings provided by Kalahi and the implementation of our Farm-to-Market Road sub-project – I am now enthusiastic and I now have high regard for myself as compared before)” says Jeraline. This inspired her to continue schooling and graduate from the K-12 program of the Department of Education (DepEd) at the Halapitan National High School, San Fernando, Bukidnon. Jeraline draws inspiration from the Kalahi-CIDSS community empowerment and gender equality perspective of the program“kasagara kaming mga babaeng lumad sige ra’g burosan sa among mga bana, ibilin ra sa balay ipagbantay og bata, usahay pasakitan pa, pero dili tanang Lumad, og mao ra gyud ang among mabuhat isip mga babae, pero dire sa Kalahi-CIDSS gitagaan kami og bili ug importansiya nga naay daghan nga mga butang nga kaya sa mga babae dili lang ang mga lalake (usually, we, the Lumad women, are just being impregnated by our husbands, left in the house to care for the children, and may be hurt at times – but not all Lumads, and that is all we could do as women, but here in Kalahi-CIDSS we are given value and importance, that there are a lot of things that women can do equally as men do)” Jeraline said. The program requires women to participate every activity especially during Sub-Project construction of at least 30% of the labor force in order to promote gender equality and importance. The implementation of DSWD Kalahi-CIDSS in Barangay Palacpacan is not without challenges, “Pasalamat mi kay taas kaayo og pasensiya ang among facilitator sa pagtudlo sa amo unsaon paghimo sa mga minutes, pagprepare sa payroll ug bayronon sa mga materyales, pag-inventory sa materyales ug uban pang butang. Bisag lisod kami pasab-ton tungod kay walay nahuman sa pagskwela apan sa among mga kasaypanan wala kami nagmahay kay daghan kamig natun-an sa programa og nabati namo mga Lumad nga kabahin kami sa pagpalambo sa among barangay (we are thankful that our community empowerment facilitator is very patient in teaching us how to draft the minutes of the meetings, payroll preparation, payment and inventory for construction materials and other things. Even if we are very difficult to teach since do not have any formal education, we do not regret being in the Kalahi program. It is here that we Lumad women felt that we can contribute to the progress of our barangay)” Jeraline said. The program is a good venue for learning different skills such as financial management, Environmental and Social Safeguards, Social Development, Construction Management, Basic Legal Documents, and other things that may help the Lumad community to educate themselves and to boost their confidence. According to the community, the DSWD Kalahi-CIDSS is a blessing to Palacpacan and San Fernando especially to the Lumad people. The Lumad community is given the opportunity through the support of the DSWD and local government units that help them grow and be part of nation building. Jeraline is hoping that the program will continue to help not only the Lumad people but also for those community or tribe who has been left behind that needs support to achieve a better and humane society. Each community has different and unique challenges, some with great challenges yet easily resolved, some appear so easy and simple yet it wounds so deep that the community itself couldn’t help but seek help from others. This story gives us a picture of the experiences of the residents in the community specifically at the river where the sub-project is located. Barangay Da-o in the Municipality of San Fernando, Bukidnon has a population of 1,145 with 353 households. It has five puroks and two sitios; one of it is Sitio Kiranggel. The Barangay is home to the Matigsalug Tribe. Farming (Corn, Rice, Banana among others) is the main source of income for the communities here; small-scale mining is also a source of income in Da-o. The barangay is 29 kilometers away from Poblacion Halapitan. The modes of transportation are jeepneys and hired motorcycles. It takes an hour and a half to travel to the barangay proper. Thus, there is difficulty on emergency responses because of its terrain and distance. Barangay Da-o was then affected by an armed conflict; in 2004 there was an encounter between New People’s Army and Philippine Army. Many soldiers of the Philippine Army were killed, but there were no civilian casualties. Currently, the security of the community is considerably safer than before according to residents. According to the Punong Barangay, Medy M. Mancilla, during year 2010 & 2015 there were flash floods that devastated the communities killing adults and children who were then crossing the river just to get home from their farm and from neighboring barangays. The main reason that the community volunteers decided on the Construction of Spillway Bridge as their number one priority is knowing that this intervention answers the need of the people. Community volunteer, Marivic Palo says “Dili na namu gusto nga aduna pay mga kinabuhi nga ma kalas ug masayang panahon nga muabut na usab ang daku nga baha (We don’t want loss of lives again, should there be floods again)”. This was based on Barangay Participatory Situational Analysis result and as decided by the Barangay assembly, it was approved. Before year 2016 concluded, there are 4 rivers to cross before reaching Barangay Da-o, and one of these is the specific location of the current sub-project. Barangay Da-o is one of the nine recipients of DSWD Kalahi-CIDSS NCDDP with P20M grant in San Fernando for the 1st cycle. Barangay Da-o has a sub-project of Construction of 12 meter vented spillway bridge with reinforced concrete pavement having a total cost of P1,357,686.95. The spillway bridge sub-project started its implementation on February of 2017 after months of trying to solve the problem by the community volunteers and Barangay officials. The implementation was delayed for more than a year since there were uncontrollable situations that arose in the community the moment it started the implementation. The community itself could not help but seek assistance from other partners just to solve the problem. All residents are the direct beneficiaries of the sub-project thus, everyone is excited to work and be involved with the implementation. The target of the sub-project is not just the physical structure but of the purpose that the community people has involvement, responsibility, accountability and ownership towards the sub-project. There is now an easy access going in and out of the community. Residents and children no longer feel in danger as they pass the spillway bridge be it day or night. The farmers are more grateful since the sub-project totally addressed the need for convenient transportation of farm products to the market. Four months after the sub-project completion, on December 22, 2017, a flash flood came with Tropical Storm Vinta, residents of the community attested that for many years they lived in the place – it was the first time they have seen the flood seemingly wanting to destroy everything. This damaged the sub-project spillway bridge. The BSPMC and the Barangay Council yet again encountered a problem after the incident because the headwalls of the spillway were damaged and boulders that blocked the flow of the water. The Kalahi-CIDSS community account is already fully utilized and has since been closed leaving the community to fend off for themselves or find ways to fund the repair of the affected parts of the spillway bridge. The barangay, with the community, sought help from the Local Government Unit of San Fernando which responded to their request in 6 month’s time. Volunteers of Barangay Da-o have learned how to help and work together in times of challenges, be it light or heavy; today, the community maintains positivity, with the belief that through unity, hardwork and dedication, any challenge they encounter can be resolved. Celebrating its 68th Anniversary with this year’s theme as “DSWD, Katuwang sa Pagbabago,” the Department of Social Welfare and Development (DSWD) Field Office 10 highlights its recognition to its various partners. These partners were recognized for their exemplary contribution in social development and social services to the poor, vulnerable, and disadvantaged individuals, families, and communities by supporting the Department in its implementation of its protective services and promotive programs in the Region. The municipality of Medina, Misamis Oriental is recognized for its outstanding implementation of DSWD’s Sustainable Livelihood Program under Employment Facilitation model, assisting beneficiaries under the Pantawid Pamilyang Pilipino Program to land decent and good paying jobs that will sustain them economically. Meanwhile, the municipality of Magsaysay, Misamis Oriental is also recognized for its remarkable assistance to the DSWD in implementing the Pantawid Pamilyang Pilipino Program in their locality. Their assistance included the provision of support in the conduct of the Convergence Initiative and Information Caravan facilitated by the DSWD, provision of logistical support to DSWD Personnel to smoothen the implementation of the program, and provided mechanisms in the form of standards, guidelines, resolutions, ordinances, strategies, and policies supporting the said anti-poverty and rights-based program. © 2019 DSWD Field Office X Official Website.